Hello everyone! 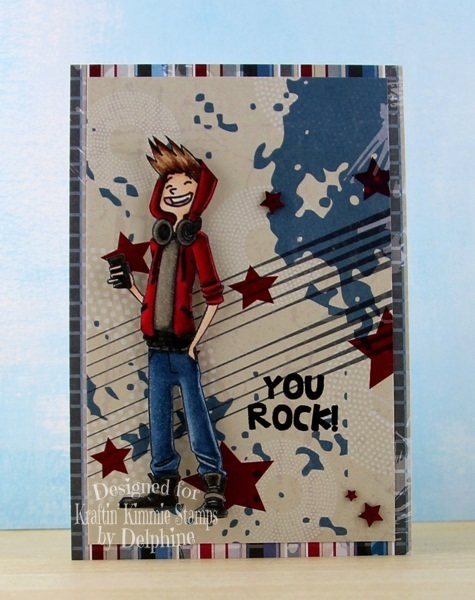 Today we are celebrating the amazing release of all of our new April stamp sets at Kraftin' Kimmie Stamps! All FOUR new sets are now available in the Krafty Shop! So let's have a hop and check them out in action! First up is LORETTA LAUNDRY... then WHAT'S UP, DUDE? ... and ENDURING LOVE! And lastly HARD WORKIN' DUDES! All the new sets are available individually but if you have to have them all, we also have our April Gimme Kimmie's Kit which includes all four of the new stamp sets together and at a discount! But only for a limited time and while supplies last! Here is my make for today, using WHAT'S UP, DUDE? What a fabulous image Delphine, I know a few in my family that would love to receive a card with this said image. Coloured beautifully as always, you really are a master with those pens. Thank you for sharing, I always know I am in for a treat when I drop by. What a super young mans card, love the image.